For districts with SAFARI Montage and SAFARI Montage Live! 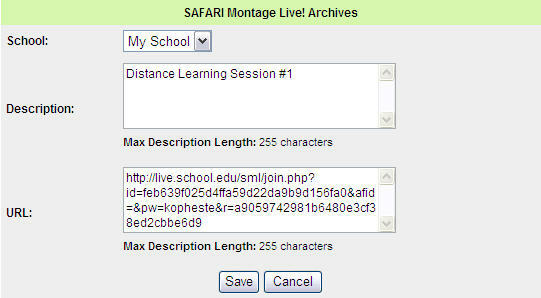 (SML), users can access and view published SML archived sessions directly from SAFARI Montage. Note: The ability to play SAFARI Montage Live! sessions is based on permissions set by the conference organizer or system administrator. Click on the 'SAFARI Montage Live! Archives' tab, on the Dashboard. The three most recently played sessions are listed. Click one of the SML sessions listed to begin playing. To view additional sessions, click the 'more »' link below the listed sessions. Click on 'Modules' tab on the SAFARI Montage dashboard. Click on 'SAFARI Montage Live' on the left-hand navigation. Click on 'Archives' in the submenu of the left-hand navigation. All available archived sessions will be listed. Click one of the SML sessions listed to begin playing. To view additional sessions, click the 'Next / Previous' navigation located above the 'Date Added' column. 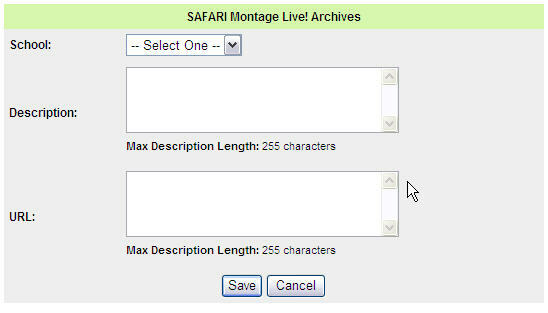 The following is a brief overview of the playback and control associated with playing a SAFARI Montage Live! session. 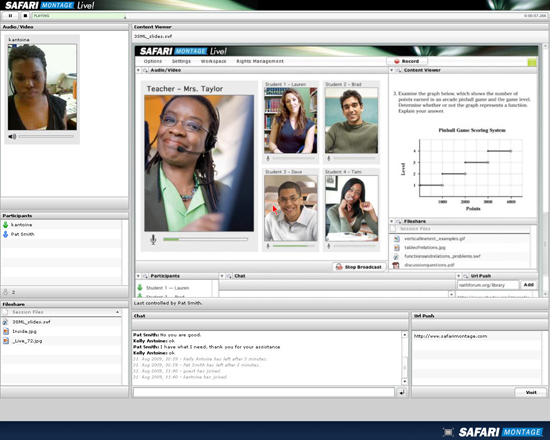 After the user has clicked a session link, the SML player will launch full-screen and is ready for viewing. To begin playing the session, click the 'Play' button located in the top left of the player. To pause, click the 'Play/Pause' button while the SML session is playing. To stop, click the 'Stop' button located at the top left of the player next to the 'Play' button. To scrub playback, click and drag the playback head to a new play location along the timeline. To switch playback from full-screen player to the in-browser player, click the 'Full-screen' ( ) button located at the bottom right of the player. To return to the full-screen player, click the full-screen button while in the in-browser player. Note: Play, Pause and Stop functions the same in the in-browser player as they do in full-screen player. Note: To configure SML integration, the user must have administrator rights. Log into SAFARI Montage as an Administrator. Click the 'Admin' tab on the SAFARI Montage dashboard. Click on 'SAFARI Montage Live!' on the left-hand navigation. Click on 'Servers' in the submenu of the left-hand navigation. Click on 'Add Server,' above the displayed server list to add a SML server. Enter a description and hostname, then click the 'Save' button. Note: If the SAFARI Montage Live! server's software does not meet the minimum version requirements, the user will see the warning below. Note: Complete steps 1-4 from 'Adding a SML Server' to reach the list of SML servers. To enable or disable a server, check (enable) or uncheck (disable) the checkbox next to the server. Note: Complete steps 1 - 4 from 'Adding a SML Server' to reach the list of SML servers. To delete a SML server, click the 'delete' link. Click on 'Archives' in the submenu of the left-hand navigation. Click on 'New Recorded Session,' located above the results list. Note: If single sign-on fails for the enabled SML server, the user will be prompted to enter their SML credentials (ie.username and password) before continuing. Note: If multiple SML servers are enabled, the user will have to choose a server before continuing. Select a SML Product from the 'Product' drop-down box. Note: A 'Product' is defined as the session type used when recording a SAFARI Montage Live! session. Click the checkbox next to the SML archived sessions to add. Note: Attendees associated with the SML archived session, SAFARI Montage will attempt to add authorized viewers automatically by matching the e-mail addresses of the sessions invitees stored in SML. To add or remove users, please see the 'Setting Permissions' section of this help page. Click the 'Continue' button to publish the session. Manually adding archived sessions may be used to publish sessions organized by others. Select a school, enter a description and paste the URL for the SML session. Click the 'Save' button to publish the session. The recorded SML session is now available to all users. To refine who can view the archived session, see the 'Setting Permissions' section of this help page. Note: Complete steps 1 - 4 from 'Add a Recorded SML Session' to reach the list of SML sessions. To delete a SML session, click the 'Del' ( ) icon next to the SML session. To edit a SML session, click the 'Edit' ( ) icon next to the SML session. Edit the session details and click 'Save'. There are three ways to define permissions to allow users to view archived SML sessions. All - Grants every user access to archived SML sessions. User Type - Grants users access to archived SML sessions based on user types. Users - Grants individual users accounts access to archived SML sessions. Click on 'Admin' on the SAFARI Montage header. Click on 'SAFARI Montage Live! 'on the left-hand navigation. Click on 'Archives' on the sub-menu of the left-hand navigation. 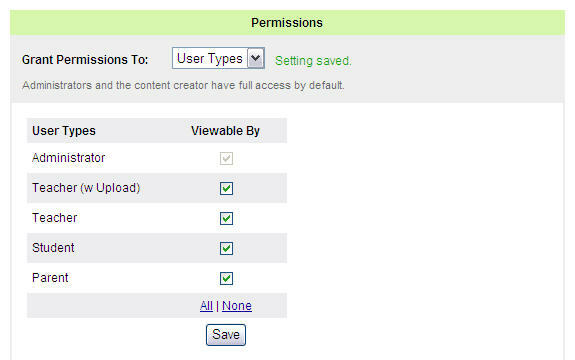 Click on the 'Permissions' ( ) icon next to the archived SML session. Select how to grant permissions by choosing a method from the 'Grant Permissions To' drop-down box. To Grant Permission to All Users – Choose 'All' from the 'Grant Permissions To' drop-down box. All user accounts now have permission to view the archived SML session. To Grant Permission to Specific User Types – Choose 'User Types' from the 'Grant Permissions To' drop-down box. Individually check (give permission) or uncheck (remove permission) for each User Type. Click the 'Save' button. Selected User Types now have permission to view the archived SML session. To Grant Permission to Individual Users - Choose 'Users' from the 'Grant Permissions To' drop-down box. Note: By default, all users are granted permission to view archived SML sessions. Note: To display a list of all users available on the SAFARI Montage server, leave 'Last Name' blank. Click the name of the users from the 'Available Choices' list, and click the '>' button to grant permission. The user's name is transferred to the 'Granted to' list and immediately has permission to view the archived SML session. To select multiple users, hold down 'CTRL,' on the keyboard, and click each desired user name. Highlight the user in the 'Granted to' list, and click the '<' button. The user's name is transferred to the 'Available Choices' list and no longer has permission to view the archived SML session. To remove all users, click the '<<' button. All users are transferred to the 'Available Choices' box and the default condition of granting all users permission is now restored.